Holland Pump manufactures hydraulically driven pumps (HDS) from 2 to 30 in., axial flow pumps to 55,000 GPM, jet pump from 4 to 8 in., prime-assisted suction lift pumps from 3 to 18 in. and rotary lobe wellpoint pump packages from 4 to 12 in. 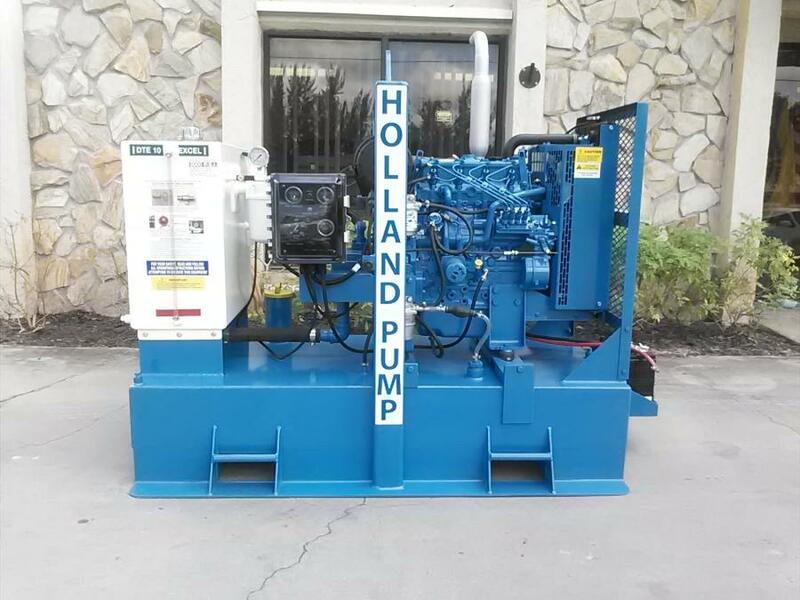 Holland Pump Company was originally founded in 1978 as Holland Pump Mfg. Inc. Headquartered in West Palm Beach, Holland has rental/sales/service offices throughout Florida and in South Carolina but sells both nationally and internationally. The company is launching Latin-American and Brazilian websites to promote pump sales throughout the region. Holland Pump manufactures, sells, rents and services pumps and accessories. These pumps are both engine driven and electrically driven and are available with a wide variety of options such as sound attenuation, controls including telemetry monitoring, GPS and remote auto start/ stop and accessories. In addition, Holland is a distributor and OEM of many products and offers a large variety of hoses, fittings, engine parts, pump parts. “Holland Pump has been a small manufacturer for almost 40 years,” said Win Blodgett, president of Holland Pump. “Initially we specialized in hydraulically driven submersible pumps which we both design and manufacture. “Over time, we became a custom assembler of not only hydraulic pump systems but also positive displacement rotary pump packages, engine and frame mounted centrifugal pumps and axial flow pumps,” said Blodgett. “In addition to being a small manufacturer, we are a leading regional pump rental company. What has set us apart from other companies is our service capabilities and application know-how,” said Blodgett. Holland Pump's average employee has 10 years of service and the company has a significant number with between 20 and 37 years of tenure. “During the Great Recession we sold off a lot of equipment but we still have a lot of extra equipment and have kept a large number of units that can be repowered,” said Blodgett. Typically, skids and trailers are very robust and are made out of 3/16 and ¼ in. (.47 and .6 cm) steel plate. “Our equipment is built like a tank and built to last. In our own rental fleet we have units that have been repowered with a new engine three or more times,” said Blodgett. Holland Pump Company also has a large supply of factory refurbished hydraulically driven submersible pumps from 4 to 30 in. (10 to 76 cm) available to purchase. The pumps come with a same as new warranty. “Prior to 2007, most distributors carried a lot of inventory. Business was great for everybody. I could order an engine and get in within two days. Now, although it is steadily improving, most manufacturers are a lot more cautious with ordering. Lead-times have increased and we may have to wait weeks for critical components. Prices have also risen very significantly especially for steel and engines,” said Blodgett. Blodgett said Holland Pump can still provide Tier III / Tier IV interim packages because the company can still Flex, which is a significant advantage. Blodgett said Holland still has a lot of Flex credits left so the company can legally provide older Tier models at a lower cost. “The time to buy is now. We also have over 30 new wet ends in stock and over 20 finished powder-coated aluminum enclosures in stock,” said Blodgett. For more information, call 800/451-0769 or visit www.hollandpump.com.